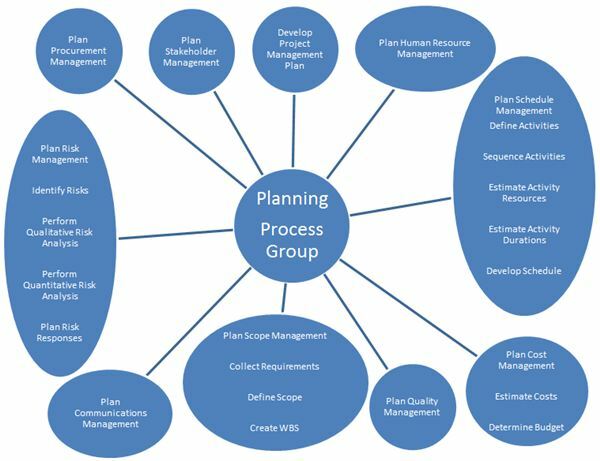 The purpose of the planning process group is to elaborate the information from the project charter to create a comprehensive set of plans that will enable the project team to deliver the project objectives. Project Management Plan: describes how the team will execute, monitor, control, and close the project. While it has some unique information, it is primarily comprised of all the subsidiary management plans and the baselines. Requirement Management Plan: is part of the project management plan. It specifi es how requirements activities will be conducted throughout the project. Define Scope: is the description of the project scope, major deliverables, assumptions, and constraints. It documents the entire scope, and is considered one of the key documents of the project, since it provides a common understanding of the project scope of the project among project stakeholders. Create WBS: The Work Breakdown Structure (WBS) is used to decompose all the work of the project. It begins at the project level and is successively broken down into fi ner levels of detail. Plan Schedule Management: is part of the project management plan. It specifi es how the project schedule will be developed, monitored, and controlled. Define Activities: all the activities necessary to complete the project work. It also describes the activities in suffi cient detail so that the person performing the work understands the requirements necessary to complete it correctly. Develop Schedule: The Project Schedule combines the information from the Activity List, Network Diagram, Activity Resource Requirements, Activity Duration Estimates, and any other relevant information to determine the start and fi nish dates for project activities. A common way of showing a schedule is via Gantt chart showing the dependencies between activities. Plan Cost Management: is a part of the project management plan. It specifi es how the project costs will be estimated, structured, monitored, and controlled. Estimate Costs: Activity Cost Estimates provide information on the cost of resources necessary to complete project work, including labor, equipment, supplies, services, facilities, and material. Plan Quality Management: is a component of the project management plan. It describes how quality requirements for the project will be met. Plan Human Resource Management: is part of the project management plan. It describes how all aspects of human resources should be addressed. Plan Communications Management: is a component of the project management plan. It describes the communication needs of the project including audiences, messages, methods, and other relevant information. Plan Risk Management: is a component of the project management plan. It describes the approach for managing uncertainty, both threats and opportunities, for the project. Plan Risk Responses: Describe the planned response strategy to the risk or condition. Plan Procurement Management is a component of the project management plan that describes how a project team will acquire goods and services from outside the performing organization. Plan Stakeholder Management is a component of the project management plan. It describes the strategies that will be used to effectively manage stakeholder participation on the project. Planning is not a one-time event. It occurs throughout the project. Initial plans will become more detailed as additional information about the project becomes available. Additionally, as changes are approved for the project or product, many of the planning processes will need to be revisited and the documents revised and updated. Many of the forms in this section provide information needed for other forms. The form description indicates from where information is received and to where it goes.